Britain's top spy, Alex Allan, the chairman of the Joint Intelligence Committee, is unconscious and seriously ill in hospital. The 57-year-old collapsed at his home earlier this week. Government sources say that there is no sign of foul play. BBC security correspondent Gordon Corera understands that there is no police involvement or concern over the reason for his condition. Mr Allan's committee collates information from MI5, MI6 and GCHQ. A Cabinet Office spokeswoman said: "We can confirm that Alex Allan was taken ill on Monday and transferred to a London hospital. "We cannot discuss his condition as it is a private matter." The Metropolitan Police said: "We were made aware of a man in his late 50s who was taken to a London hospital after being taken ill at his home address. "He remains in a serious condition. This is being treated as non-suspicious." The Joint Intelligence Committee (JIC) is responsible for briefing ministers and officials with intelligence assessments on issues such as security, defence and foreign affairs. It is part of the Cabinet Office, and briefs the prime minister weekly. The JIC chairman collects information from members of the Security Service, MI5, the Secret Intelligence Service, MI6, and Government Communications Headquarters who sit on the committee. The deputy chairman takes over in the absence of the chairman, but Cabinet Office policy is not to publicly name the person. 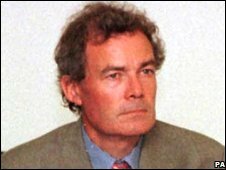 Mr Allan was a civil servant who worked mainly in the Treasury, before becoming principal private secretary to both John Major and Tony Blair when they were prime minister. He took the post of high commissioner to Australia in 1997. In 1999 he became "e-envoy" for the government, co-ordinating policy on e-commerce among different ministries and departments. He left that post and moved back to Australia a year later before returning to the UK in 2004. Downing Street announced his appointment as the chairman of the Joint Intelligence Committee and Head of Intelligence Assessment late last year. Mr Allan's artist wife, Katie Clemson, died from cancer last November.